Hello! So I ended up in China over the weekend at Beijing Foreign Studies University to present at the 3rd annual Boya Forum 2013 undergradute conference. And what a weekend it was. Surreal is one of the best words to describe it, mainly because I was somewhere so far away for such a short amount of time (only 3 days). Luckily, I still had a little bit of time to explore, so I have split this blog into two sections: the academic experience and the confused tourist experience. I was one of two students from Lancaster sent there to present at the event, which was hosted by BFSU’s School of English and International Studies. It aimed to celebrate the undergraduate research abilities of students in several disciplines from the arts and social sciences. The participants represented a total of 27 universities, and I was from one of only three universities from outside of China. The conference was an intense day of talks and discussions (70 presentations in total!) that ran from the early morning right through into the evening, and my talk was right at the end of the day so I knew I would have a job of trying to keep my audience’s attention. I’d like to think I managed to do it. 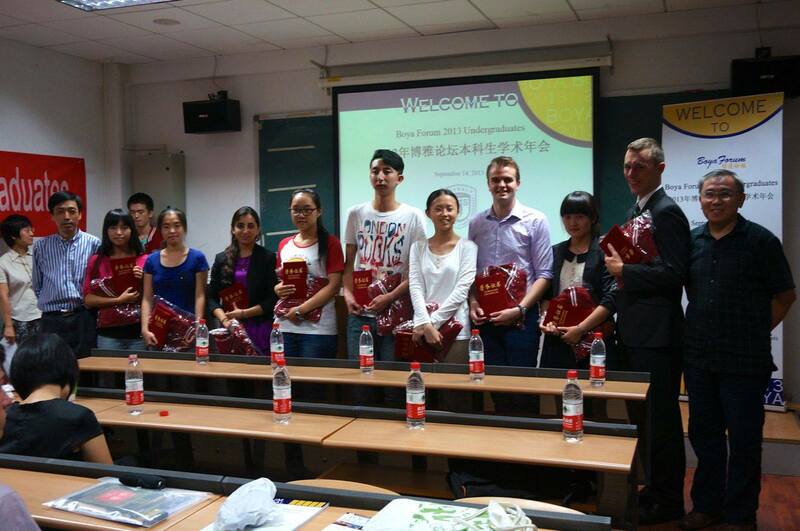 I never imagined I’d end up presenting my work so soon – let alone in China! After my talk (slides available here) I was posed some really interesting questions about my work from both the professor who acted as “commentator” for the session and from other students in attendance. It was also really great to see four or five other presentations from Chinese students who had used corpus-based techniques in their research, and to be able to discuss how our approaches differ. 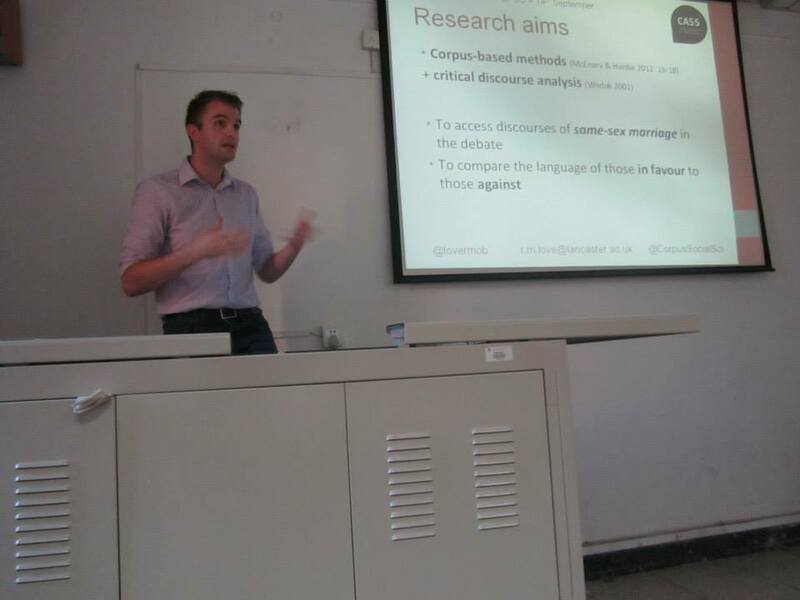 It really seemed that there was a genuine interest in the application of corpus-based methods in the study of all manner of language data – I’m confident I was able to fly the flag for the field and demonstrate that it can be very useful. At the end of the day there was a closing ceremony where the professors from BFSU awarded prizes for the best presentations of the conference. I was very happy to win a “First Prize for Best Presentation” award and an official BFSU jacket to match. I wore it proudly on the long journey back to Lancaster! Those of us who had travelled from abroad to make it there were also treated to a post-conference banquet in the BFSU Hotel. I wasn’t aware of the Chinese convention that if you leave an empty plate it means you are still hungry rather than full – so as a result more and more food kept appearing even after we started to look physically unwell for eating so much. It was all delicious though. I have nothing but praise for the organisers of the conference – it really was a brilliant day and I feel so lucky to have been part of it. It certainly was a fantastic experience, and I am extremely grateful to CASS and BFSU for jointly funding my visit. I only wish I still counted as an “undergrad” next year to be able to go again! (Check out the CASS website next week for a more detailed account of my experience at the Boya Forum 2013 conference). With the conference being held all within one day on the Saturday, I had time on Friday and Sunday to do a little bit of tourism. 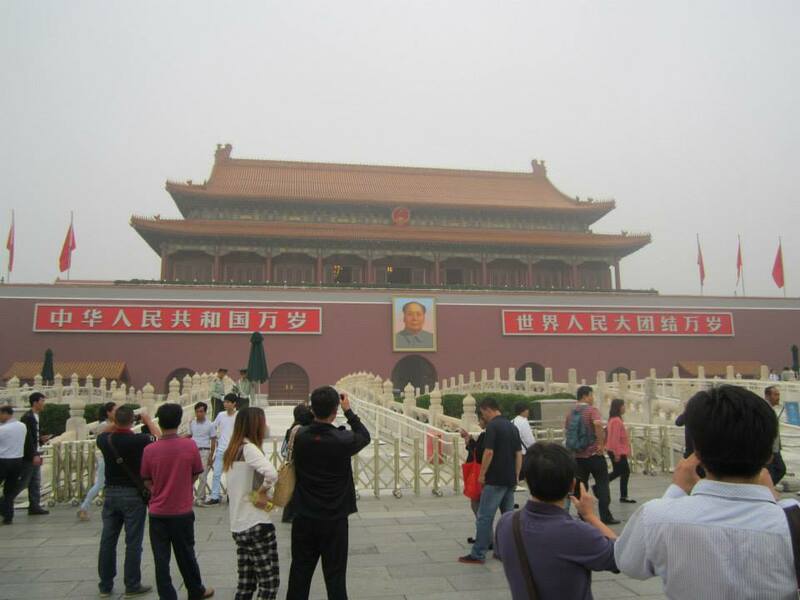 I have no idea when or if I will ever go back to Beijing so I wanted to make sure I saw the big sights while I was there. 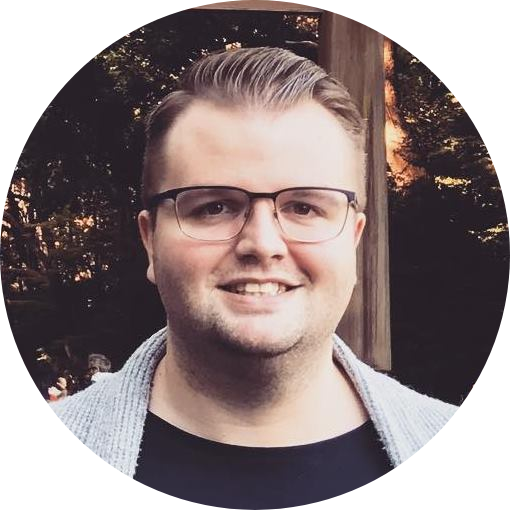 Unlike previous travel experiences where I have been with someone who speaks both English and the language our destination, I was very much alone as an English speaker in a predominantly monolingual, Mandarin city. What this meant was that travel by anything other than the subway (which translates Mandarin into Pinyin, the Roman alphabet equivalent), was a fairly interesting experience for someone who hadn’t learnt a word of Mandarin before his trip! On Friday, after landing in Beijing very early in the morning, I had the whole day to myself before George, the other Lancaster student, arrived in the evening. After sleeping off a bit of jet-lag I headed to the Forbidden City, right in the heart of central Beijing. This is a massive, massive palace that housed emperors for hundreds of years, and for the last 80 years or so it’s been opened up as a museum. I was told that it’s one of the biggest tourist attractions in Beijing and it was pretty easy to get to by subway from the BFSU Hotel. So far so good! I could see why it’s so popular as soon as I arrived. It really is an incredible place and its size certainly deserves the title of “city” – it’s huge! Unfortunately I timed my arrival badly, and once I had entered the main grounds (pictured below) I was told by a friendly looking tour guide that the main museum had actually just closed and that I couldn’t get in! Despite my disappointment I told him simply that I’d take a few photos of the outside and head somewhere else. I hadn’t known that if I had simply turned around and crossed the road I would have also seen the incredible Tiananmen Square. Beijing – 1, confused tourist – 0. The tour guide, though, had different ideas. He offered to take me on a one-to-one personal walking tour around the perimeter of the Forbidden City and up to Jingshan Park, said to offer great panoramic views of the Palace Museum and beyond. Usually I’d be very wary of “tour guides” who offer to take you away somewhere (and particularly because I was completely on my own!) but for some reason, perhaps my utter disorientation from the journey and being somewhere so different to Lancaster, I found myself quite happily agreeing. Luckily “Brian” was kosher and indeed he took my all the way up this hill for some spectacular views of the city. We even did a traditional tea-tasting ceremony (picture below) and I couldn’t help but chuckle at the absurdity of the whole situation, so out of context from sitting in the CASS office a day earlier. 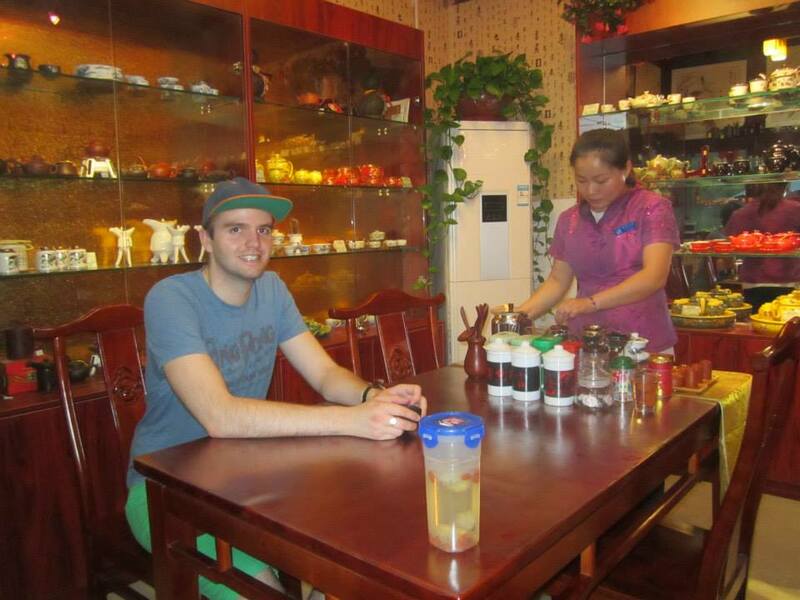 Traditional tea-tasting ceremony at Jingshan Park…a little on the expensive side but the tea really was great. Of course, being in a traditional tea shop in the middle of China’s capital, I felt I would have been doing a terrible injustice if I walked away empty handed. So I ended up picking up not one but three different kinds of tea. Probably enough to last months, if not years! Once I made it back to BFSU and met up with George we set up a make-shift brewing system in the hotel room and somehow managed to recreate some of the tastes I had experienced at the ceremony with Brian. A nice way to relax before our busy day at the conference on Saturday! On Sunday, after a night out with a few of the American students who had also presented at the conference, a girl called Zayba and I decided we needed to tackle the Great Wall on our last day in Beijing. Everyone else had already left at this point so we were the last two left, and I would have felt cheated had I gone all the way to China and not “walked the wall” while I was there! The nearest tourist spot by the wall, Badaling, is about 50 miles or so north of the city, so we set off to the northernmost subway station with the plan of getting a taxi the rest of the journey north from there. Simple enough, or so it seemed. However our taxi driver had different plans, and dumped us in an empty car park by a very quiet portion of the wall on the way to Badaling, seemingly because he simply didn’t want to drive us any further! We enjoyed the silver lining of our abandonment by being able to walk on the wall with no other tourists anywhere in sight, but in the back of our minds we were wondering how on earth we would be able to get another taxi from here at the end…it was very deserted! 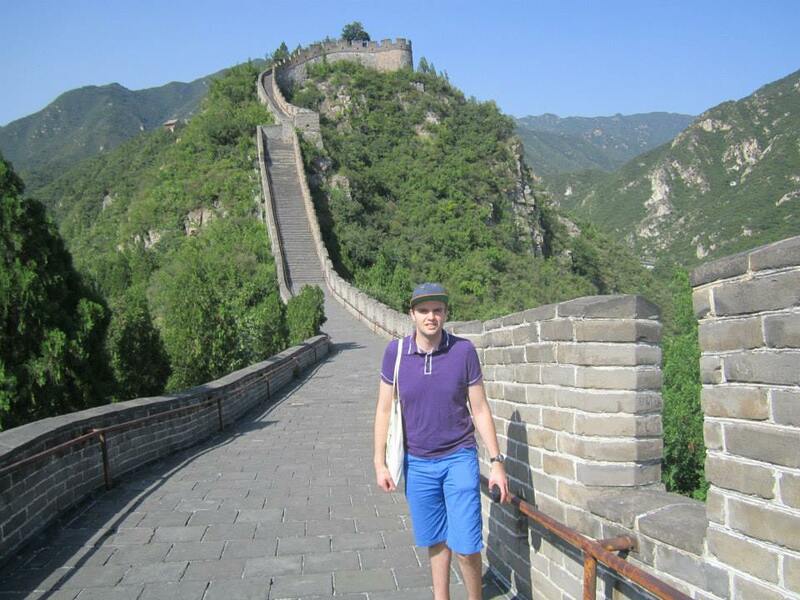 The Great Wall…all to myself. Mwahahahaha. Luckily, once we climbed down we managed to find another taxi driver who took us to our intended destination: Badaling (only after trying to do the same as the previous driver and dump us somewhere far from where we actually wanted to go. This time I persisted and simply refused to get out of the car!). From here we took a cable car up to the top and were met with the most spectacular views of the Great Wall seemingly on every side of the horizon. Truly amazing. It was only then that I relaxed and realised that I’d actually made it to one of the Seven Wonders of the World. It felt like we had barely been up there a few moments before we started to wonder how on earth we’d get back down (we could only buy a “one-way” cable car ticket). Soon enough we found a sign pointing us 2 kilometres down the wall in the direction of a “descending slide” – whatever on earth that meant. When we got there we realised there was some sort of toboggan constructed on a track that ran all the way back down to ground level from the wall high up above. We also realised they were about to run their last slide of the day, so to speak. So we made a dash and hopped on for one of the most surreal experiences of my life…sliding down the side of the Great Wall of China not having a clue where we would end up at the bottom. As it turns out, where we ended up at the bottom wasn’t simply another part of the tourist centre but also a bear zoo, of all things. By this point I was sufficiently disorientated (once again) and we managed to make it back to the BFSU Hotel in the city centre within another couple of hours. And, with that, my weekend in China, my Boya Forum 2013 experience and my time as a quintessentially confused tourist was over. I made the day-long journey back to Lancaster the next morning. For all there was a bit of stress involved in getting around I had a truly amazing time and can’t wait for another opportunity to go back. In the meantime I am only two weeks away from starting my MA in what I expect to be the busiest year of my academic career so far. And, though the Spine on Lancaster campus doesn’t quite have the same aura about it as the Great Wall, I look forward to walking it all the same as I take the next step in what has so far been an incredible journey.